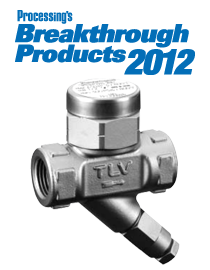 TLV is pleased to announce that its P21S ver. C disc trap was selected as a winner for Processing Magazine's "Breakthrough Products 2012" award. Specially developed to provide reliable service in copper tracing applications, the P21S ver. C was selected among all applications for the quality of its compact, high-performance design, which saves time, money, and energy. Many users familiar with copper tracing lines have experienced significant blockages often caused by copper leaching out of the tubing into solution, then later precipitating out of the condensate during subsequent flashing during trap operation. The result can be a high blockage rate on the steam traps installed on copper tracing lines. The P21S ver. C incorporates TLV's effective discharge port technology to carry such copper precipitate out of the trap before it causes excessive trap blockage. According to TLV's Consulting & Engineering Services department, this is one of the most common steam trap difficulties in tracing lines that have been targeted for improvement by the P21S ver. C design. In addition, the P21S ver. C design includes an integral Y-strainer to facilitate quick start-up while removing system debris, and with the addition of the optional BD1 blowdown valve enables achieving a "zero-energy" state during maintenance. As a member of TLV's PowerDyne® family, P21S ver. C also incorporates an effective air-insulated jacket that resists negative environmental conditions to minimize the cycle rate and steam loss during operation. 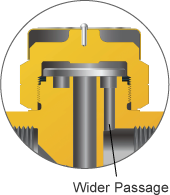 Combined, these features help ensure superior performance and virtually eliminate no-load actuation. Additionally, energy and reliability improvements are further achieved through unique refinements such as the heat-treatment hardening of seating surfaces for enhanced durability and their high-precision finish to ensure tight sealing during operation. P21S ver. C is a Processing Breakthrough Product 2012 to help those sites who are looking for a better solution to the problem of blocked steam traps in copper tubing tracing lines. The P21S ver. C is purpose-built for troublesome copper tracing applications.